Cover Ross Andru (Pencils) Mike Esposito (Inks). Bob Kanigher (Script), Ross Andru (Pencils), Mike Esposito (Inks), ?. (Colors), ?. (Letters). ------ --from DC from 1966 ---- ------------------------------------------ ---------------. Factory sealed DC Archives METAL MEN Vol. 2 in excellent condition. See pictures for further inspection. Combined and international shipping available. SHOWCASE #39 METAL MEN 1962 VG cond. 3-Part Metal Men story!!! Metal Men 1963 DC Comic Book #1. Shipped with USPS Priority Mail. Various wear, all adds up to keeping these in the VG'ish range. I've been a comic collector/dealer for 35 years and have a very good reputation in the industry. 2 decent copies, flat, square, colorful. We estimate this comic to be in Good- (G-) condition, with creasing, tearing, spine-rounding, edge-wear, and discoloration. This comic issue has been inspected and is COMPLETE, no pages or coupons have been removed! Showcase 37 CBCS 3.0 with Off-White to White Pages. This book has a VG 4.0 grade. Has a vertical bend in the center of the comic. See scan for more details. I will stand by the Grades I put on theses books if you feel the grade is off significantly I will take the book back. This comic is not professionally graded. I have attempted to take several pictures so you can see the condition for yourself. THE ITEM WILL BE IN THE EXACT CONDITION THAT IS SHOWN IN THE PICTURE. 5-10 comics is 6.99. Grade Near Mint- (NM-) Very Fine / Near Mint (VF/NM) Very Fine (VF ) Very Fine (VF) Very Fine - (VF-) Fine / Very Fine (Fine/VF) Fine Fine Fine- Very Good / Fine (VG/Fine) Very Good (VG ) Very Good (VG) Very Good - (VG-) Good / Very Good (G/VG) Good Good Good- Fair / Good (FR/GD) Fair Poor. This book appears to be in good to very good condition. colors and inner pages look sharp. slight creasing around the edges on the front cover. they have not been opened in decades. Metal Men Silver Age DC Comic Lot 7 Books #2,3,5,7,10,21,24 awesome condition! We estimate this comic to be in Very Good (VG) condition, with creasing, tearing, spine-rounding, edge-wear, and discoloration. This comic issue has been inspected and is COMPLETE, no pages or coupons have been removed! METAL MEN #1! KEY ISSUE, 5TH APP! DC COMICS 1963! ROSS ANDRU! SEE PICS! WOW! Actual pictures of comic being sold. Lower grade copy. tears, staining, rust on staples, detached cover and centerfold. The photo is of the actual copy that you will receive. A solid reading copy. 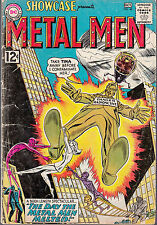 Metal Men #2 DC Comics 1st Series 1963 . Shipped with USPS First Class Package. We estimate this comic to be in Near Mint (NM) condition, with minimal creasing, spine-rounding, edge-wear, and discoloration. This comic issue has been inspected and is COMPLETE, no pages or coupons have been removed! We estimate this comic to be in Fair (FR) condition, with significant creasing, tearing, spine-rounding, edge-wear, and discoloration.Writing on cover. This comic issue has been inspected and is COMPLETE, no pages or coupons have been removed! "Witch Hunt-1969" with story and art by Mike Sekowsky (pencils) / George Roussos (inks) (24 pages) featuring the Coven of Seven and a host of demons (first and only appearance). Overall condition is VG/FN (5.0). No tape, no tears, cover and centerfold well attached, large crease front cover from bottom edge to outside edge,(see scan), small pencil mark front cover, would be FN without crease. Showcase #40 (DC)(1962) in good 2.0 condition. Solid complete copy with no missing pages and nothing clipped out. All staples attached to cover and centerfold. No restorations. 1st printing. The pages are lightly-tanned (Owl 7) and in nice condition. Metal Men #28 Nov 1967 Gold,Platinum,Iron,Tin,Lead,Mercury DC FREE SHIPPING in the USA Nice lower f or vg/f grade comic , pages are off white to cream and interior is nice and solid, tight and complete,creases,general wear,1/2" inch tear top of front cover through "DC" Logo but book still looks and feels great !!! !.